After five years at LinkedIn and a prior decade spent at tech startups, Erica Lockheimer had grown used to navigating a male-dominated workplace, despite bumping up against the occasional gender-related bias. Over the years, Lockheimer, a software engineer, made a point of attending women-in-tech conferences and diversity programs to learn to steer around those roadblocks and advance her career. As her confidence grew, so did her desire to leverage those experiences to coach female colleagues struggling with similar issues. Lockheimer's grassroots efforts to keep gender diversity in the spotlight caught the attention of LinkedIn's top engineering brass, who wanted to double down on attracting and retaining female talent. Lockheimer, 40, now senior director of engineering growth at LinkedIn, pitched them a plan to make gender diversity account for 20% of her job responsibilities and performance metrics. Having a dedicated Woman in Technology (WIT) executive team, Lockheimer argued, would ensure the company had all the key ingredients for gender diversity success, including a formal roadmap, executive sponsors and a healthy budget. "We want to really commit to it and hold people accountable like any other project," she explains. "If it was on a volunteer basis, we'd make only incremental progress." "Incremental" is certainly one way to describe the status of gender diversity in corporate America as a whole and the tech workforce in particular. A 2015 Women in the Workplace study (pdf), born from a partnership between LeanIn.Org and McKinsey, found women are underrepresented at every level of the corporate pipeline. According to the study, in 118 companies surveyed across all industries, an average 45% of entry-level professional positions are held by women. But that number shrinks considerably as you move up the ladder -- to 37% for manager roles, 23% for senior vice presidents and only 17% for the C-suite. The situation is even more extreme in the technology sector, which has come under fire for its low numbers of female employees and a culture that is non-inclusive, sometimes even toxic, to women. By aggregating publicly available data from nine technology companies -- Apple, eBay, Facebook, Google, Intel, LinkedIn, Microsoft, Twitter and Yahoo -- the Wall Street Journal recently determined that women on average hold 26% of those firms' leadership positions and just 18% of their technology jobs. Similarly, a publicly shared spreadsheet tracking women who are specifically writing or architecting software (created by a female software engineer at Pinterest) indicates that only about 19% are female across the 84 companies reported on. That's a real problem for businesses, and not just a human resources problem. Solid representation in the workforce from both genders ensures products and services meet the needs of the total market, not just a specific slice, hiring experts and business leaders say. Moreover, men and women bring different skill sets and operating styles to the table, each essential for achieving technology-driven business success. "To be the best out there, you need to provide products that are good for diverse people. If only one type of person is coming up with those product designs and technology, then you are not presenting the best options to your customers," says Caroline Sieber, vice president and HR business partner for technology at American Express. "You need a diverse set of skills." As part of a far-reaching diversity initiative, AmEx has multiple efforts in play to promote gender diversity, including recruitment, training, community building and mentoring programs. The goal is to mitigate the challenges for female tech employees by fostering peer support, providing networking forums and teaching women how to find and align with champions who can open doors to new opportunities. Similarly, at LinkedIn, Lockheimer reports that the WIT exec team now has close to 50 participants who spend about 5% of their time promoting gender diversity by chairing committees, hosting meetups, sponsoring STEM programs, and coaching, among other initiatives. Thanks to WIT and other efforts, within a 12-month period, LinkedIn managed to inch the number of females in technical roles up by 1% and the overall number of women employees up by 3%, representing 19% of the total workforce of 9,200 employees. The gains prove the company is on the right track, Lockheimer says, though she admits that there's more hard work to be done. If your organization has work to do in reaching gender parity, consider following these five tips as recommended by diversity champions like Cisco, GoDaddy, Salesforce and AmEx. Since it's no secret that gender diversity and pay parity are ongoing problems nearly everywhere in the industry, some companies are taking the tack of publicly disclosing their hiring numbers and salary data -- as well as their goals for improvement. Last summer, Twitter joined the ranks of companies like Google and Pinterest in releasing its gender diversity targets. By late 2016, Twitter hopes to have 35% female workers in its ranks globally, up from 34% currently; 16% women in tech positions, up from 13% now; and 25% for leadership roles, up from 22% today. Other tech companies, including Salesforce and GoDaddy, are taking the transparency mandate one step further, releasing not only gender diversity targets, but also salary data to round out the picture. Salesforce doled out $3 million last year to bring female salaries on par with their male counterparts, after initiating a study that uncovered the disparity. GoDaddy released its pay-parity numbers last year, as part of a multi-pronged strategy to rehabilitate a corporate image that was negatively associated with the scantily clad women it used in earlier advertising campaigns. The report revealed that women in technical roles make about 99 cents on the dollar, while those in the management ranks were paid an estimated 96 cents on the dollar. The same report found that women represented 20% of its technical workforce and 25% of its overall employee ranks, with women in management roles hovering at around 25%. "It's been a great recruiting tool for us, and it's about doing what's right," says Katee Van Horn, GoDaddy's vice president of HR. "We're putting our money where our mouth is and showing people that we are actually doing this because it's important to us." Mentoring and sponsorships are staples at most larger organizations, and essential to fostering an upward trajectory for female tech employees, who tend to lack the network breadth enjoyed by their male counterparts, experts say. 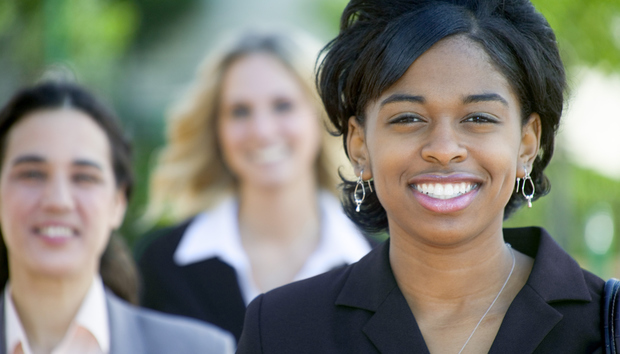 The McKinsey/LeanIn.org report found that while men and women's networks were similar in size, their makeup was quite different, with women typically having fewer connections than men to senior-level executives. Companies like Cisco and American Express are working hard to shift those dynamics with myriad formal and informal mentoring programs, including several that target high-potential female employees. At Cisco, directors hand-pick female engineers to work with an executive mentor in three- to four-month stints -- the goal being to promote and foster retention of key talent. At American Express, advocacy efforts ensure that women are well represented in a 12-month program that pairs 16 high potential employees of both genders with senior technology leaders for mentoring, networking opportunities and the potential for sponsorship. This kind of relationship is critical for women to gain visibility, says Katrina Roberts, vice president in the technology organization at American Express. "Women have to be encouraged to network; it's not necessarily something they feel comfortable doing," says Roberts, who went through the program. "The more people are talking about you, the more opportunities come up that might not be on your radar screen." Roberts knows of what she speaks. Over the years, her mentoring relationship with CIO Mark Gordon evolved into a sponsorship, which just culminated in her recent promotion to head of consumer and commercial lending technology, reporting directly to Gordon. "It's so important for women to realize the power of networking and sponsorship -- it can really change your career," she says. Recruiting processes are often rife with unconscious gender bias, experts say, citing specific practices like male-dominated hiring panels or recruitment ads that are stacked with a lot of aggressive, male-oriented language. To guard against that, training programs at Cisco condition hiring execs to push for more female candidates for every potential hire, while the company's move to promote more diversity on its hiring panels has increased the odds of hiring women by as much as 50%, says Liz Centoni, vice president of engineering. "If you're going in and sitting in front of six men who are using words like 'ninja,' it's quite likely you're going to be put off," she explains. GoDaddy has made similar modifications. Where previously programming candidates were asked to demonstrate their coding skills solo, standing up at a white board, they now can explain and diagram their thinking in a more collaborative, sit-down environment that is more akin to females' more social style of working. The company is using an online software tool that employs machine learning and statistical techniques to analyze and rate job descriptions for gender tone. In one example for a senior software development manager, the software flagged language that was absolute, such as "experience managing multiple customer projects" and "providing world-class customer service," says Andrew Carges, the firm's vice president of talent acquisition. The more gender-friendly descriptions were rewritten as "the ability to juggle several projects at once without dropping the ball on details," and "being 100% comfortable picking up the phone and speaking directly to customers," he says. Blake Irving, CEO of the 5,000-employee company, has also been known to pick up the phone to try to close the deal with high-potential female candidates. "I'm not sure many companies are going to that extreme," Carges says. Cultivating communities where women tech employees can share experiences, exchange ideas, network and even commiserate about challenges is fast becoming a key pillar of companies' gender diversity plans -- whether it's an internal group or participation in external women's technology organizations, or both. PROS, which markets cloud-based analytics software, launched its Blaze women's organization last year, started organically by two employees who got interested in gender diversity issues after reading the book Lean In. What started out as informal discussion using the firm's Yammer social networking tool grew into an in-person discussion group of a couple dozen women and eventually, a 100-person-and-growing group, complete with a mission statement, an executive sponsor and its own reception at last year's Grace Hopper Celebration of Women in Computing. "There are a lot of gender issues and we really wanted to make sure women here feel supported and have avenues to help facilitate their professional development," says Jennifer Plummer, application lead, who's been at PROS for 10 years. While Plummer says it's too soon to have measurable results, she maintains the fast-paced growth of the group and its better-than-expected turnout at the Grace Hopper reception is an indicator that the Blaze community has struck a chord. The lack of women in STEM has been well publicized, and companies are exploring numerous ways to coax more women into the workforce. Companies like Cisco, LinkedIn and American Express are starting at the earliest stages, partnering with grade schools, high schools, universities and STEM-oriented girls' groups to promote competitions, hands-on learning and mentoring opportunities, even internships to get girls more exposure to computer science. The national non-profit Girls Who Code, for example, last October announced a partnership with 26 tech companies, including Twitter, Facebook and Microsoft, which promised to give hiring consideration to that program's alumnae. The annual Grace Hopper conference, the largest gathering of female technologists in the country, has become a fertile feeding ground for talent. Cisco, for example, interviewed 1,000 female candidates at last November's 2015 conference, and, a first for the company, made many offers on the spot, says Cisco's Centoni. 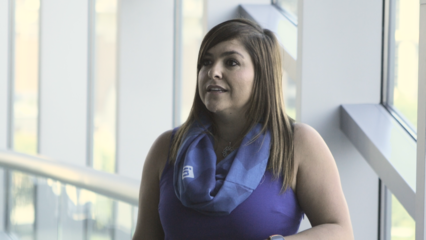 Sadaf Tayefeh, a software engineer who started with GoDaddy last summer right out of the University of Illinois, was introduced to the firm at the 2014 Grace Hopper conference and was back the next year doing her part for recruitment. "It felt amazing to be talking to people when I was in their place last year," notes Tayefeh, who says GoDaddy's emphasis on making the workplace more women-friendly was a big factor in her coming onboard. While these initiatives are making headway in closing the gender gap, it's still early on, and not every program will be an outright success, industry-watchers say. Some companies, like PROS, believe that the effort can't be driven from the top -- instead, there needs to be a groundswell of support for gender diversity at the grassroots level or programs will stall. Others, like GoDaddy, maintain having the CEO's active participation and support will go a long way in helping the initiatives gain traction. At Cisco, advancing the ball on gender diversity is an imperative that comes from the C-suite, with backing all the way through the rank and file, says Centoni, who underscores that it's too early to rule out or characterize anything as not working. "I wish there was an easy button to accelerate things or a magic wand to wave and say we're done," Centoni says. "We will continue with the initiatives underway and add more as we see fit. This is a commitment, not a campaign, and a commitment is for a long time."